Ever envy why those girls are so skinny despite eating so much? Ever wish to get into that dress that you like? The guy that you like say that they don't like fat girls? Diet with all your might to maintain that figure? Well guess what, there's a drama about this whole story of us, and it's Rebound! I have watched this years ago in fact, and when I found out about this drama, the couple is Aibu Saki X Mokomichi Hayami and it's like they're reunited from Zettai Kareshi Drama! So maybe because of the chemistry between Aibu Saki and Mokomichi Hayami, they have another love story drama for them! And what's better is we also have one my Girl Crush, Kuriyama Chiaki, to play as Aibu Saki's friend! "Oba Nobuko (Aibu Saki) is a girl who loves eating, well who doesn't? It's because her family owns restaurants and her addiction toward sweets which make her body growing slowly but surely. By the time she reaches adulthood, her weight is 78 kg's and growing. She thinks it's fine until her boyfriend can't take it anymore so they break up. Being broken hearted, she decides to lose weight and everything turns perfect after that. She can wear cute clothes, all the men's stare are after her, and she works at prestigious fashion magazine that she always dreams of! But it doesn't last long because she has to make a review about a cake shop that she used to like when she was kid. There she met the handsome patissier and the owner of the shop, Imai Taichi (Mokomichi Hayami). Though his handsome appearance won the heart of Nobuko, sadly the cake says is not. The review becomes bad, and so the shop is out of customers afterwards. Feeling guilty, Nobuko tries to help Taichi to make delicious cakes but what awaits her is endless cakes eating progress and so she rebounds to her old self again"
Japanese make up is so awesome they're able to make someone so pretty like Aibu Saki to a fatty girl, and it looks so natural!! O.O I wonder how they do it? I wanna learn !!! I mean, who won't gain weight if she has to eat that many cakes everyday? When watching her action to be in shape, I suddenly feel an urge to work on my body as well too! I know some of you find me not fat, but I have fats on areas that is difficult to see such as upper arm and tummy. I have big upper body although my legs are skinny T.T Anyone has the same problem? 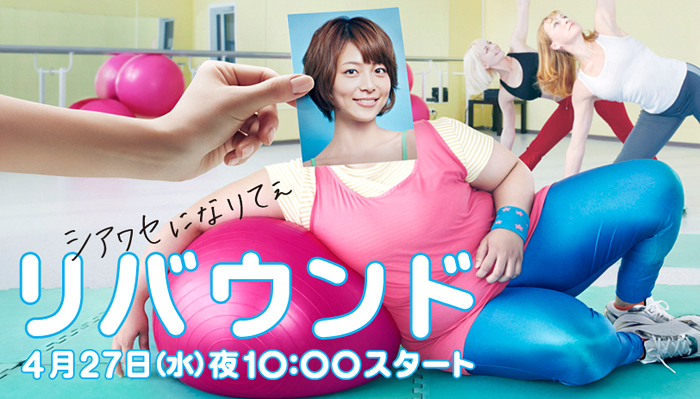 So I promise to myself that I will be more active in working out after watching how Nobuko can get in shape nicely! If she can, why can't I?! That's actually kind of explaining my face when I'm in front of foods.. So of course we see how problematic and difficult life is for Nobuko! But when she gets back in shape there's another problem waiting! While Taichi didn't see Nobuko, he's busy making cakes and he becomes fat! Turns out that he used to be fat, that's why he doesn't want his girlfriend to be fat as well. Though Taichi giving up to be back in shape, Nobuko cheers him up [Kind of..? lol] and so he resolutes to do any thing that he can to make Nobuko like him too!
" Is the skinny body really what I want until I risk my health? " " Do I have to be skinny to please someone else? " " Won't anyone like me if I were fat ? " I only watch half of the series because at that time it's so difficult to find this drama and some episodes were not subbed yet and I didn't understand Japanese! T____T So I still don't know what the ending is about, but thanks to WAKUWAKU Japan TV! Now I can watch it on my TV without waiting the long buffering [Only God knows how bad the internet connection in Indonesia is], with great subtitle, and of course high quality and clear images! So, any of you will watch it together with me and find inspiration to lose weight as well? You might want to check this out as Rebound will be aired 4 times on WAKUWAKU Japan! It will start from Wednesday, 30th April 2014! Keep your date to watch this cute drama! Can I see this somewhere online? I don't know what's Wakuwaku as I don't live in Indonesia(??). Lol, after this post I watched the whole series! It was good!! Story of my life, rebounding thousand times. woahh your hair is so cute!